The practice of Myron L. Hall, DPM is ideally located in the most northwestern part of Los Angeles, roughly 1 mile east of Beverly Hills and 2 miles south of Hollywood. The office is also conveniently located within 2 miles of Cedars Sinai Medical Center, where Dr. Hall is a Staff Podiatrist and performs all of his surgeries. The practice offers comprehensive foot and ankle care which includes general Podiatric Medicine and surgery. Dr. Hall provides the expert evaluation, diagnosis and treatment of Pediatric and adult foot and ankle concerns, diabetic foot care, care for foot skin and nail disorders such as calluses, ingrown nails and fungal problems, sports –related conditions of the foot and ankle, industrial foot and ankle injuries and foot and ankle trauma. 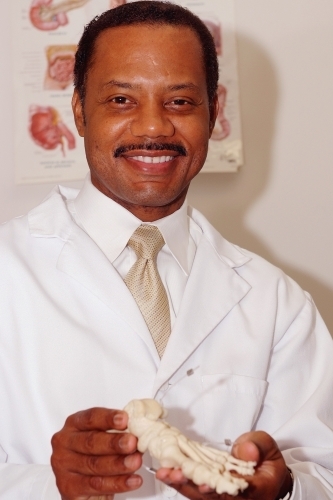 Dr. Hall is certified to perform elective procedures to correct minor and major foot deformities such as bunions, flat feet and hammertoes, removal of masses and skin lesions, repair of traumatic injuries to the foot and ankle, and reconstruction of the foot and ankle and management of infections within the foot and ankle. The practice offers a broadened scope of accessible foot medicine by providing house calls in private homes and outside care in assisted living centers such as nursing homes, rehabilitation centers, and skilled nursing facilities. Dr. Hall’s office has staff who are fluent in Spanish, Farsi, and English. There is parking in the beautiful building which Dr. Hall will validate for you on every visit.